Too much communication in the world of religion is one-way: from clergy to lay persons who, if ever respectfully engaged, would become serious inquirers. The most desirable means of effective engagement is the give-and-take method of eliciting and clarifying questions and then drawing the questioner into the answering process. That, combined with the intellectual rigor of Enlightenment thinking in the formation of beliefs, will go a long way toward making contemporary religion a here-and-now enterprise, thus saving it from hopeless irrelevance. ""Sensitive to the cultural and power dynamics behind the church's attempts to control discourse about God, Cook faces honestly, bravely, and creatively into real theological questions posed by real people. The result is a book perfectly suited for lay and clergy readers who wish to build faith communities on a shared foundation of openness, mutuality, and trust. 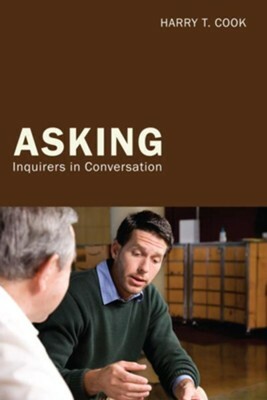 Elegantly and accessibly written, intellectually compelling and honest, Asking is a wonderful resource for individual and group inquiry."" --Gary R. Hall Former Dean and President Seabury-Western Theological Seminary ""After a lifetime of reading, I can say that The Rev. Harry Cook does more than anyone I have ever known to stimulate thought and discussion about what is valuable in the Christian message for the early twenty-first century. Since the discovery of fire, man has progressed principally by asking questions--and Father Cook asks precisely the right ones in this essential little book."" --Jack Lessenberry Michigan Radio and Wayne State University ""Harry Cook writes out of two basic convictions: that egalitarian dialogue rather than hierarchical pronouncement is the appropriate means of dealing with religious questions and issues, and that the same rational/empirical approach used in other areas should be used in dealing with religious questions and issues. What he deals with originates in his ongoing conversations with real people through forty years as an Episcopal parish priest. The result is a refreshingly feisty, brashly honest probing of what religion is all about."" --Harvey H. Guthrie Dean and Professor of Old Testament, Emeritus Episcopal Divinity School ""Imagine a world where fundamentalism becomes irrelevant because it lacks the complexity and wisdom of dialogue. Reverend Cook retrains us to ask, 'How can we be honest?' In doing so he creates a new paradigm for clergy and, perhaps more importantly, for our capacity to live authentically as human beings."" --Rabbi Tamara Kolton Harry T. Cook is an Episcopal priest whose primary area of research is first century CE texts of both Jewish and early Christian origins. He is the author of Christianity Beyond Creeds: Making Religion Believable for Today and Tomorrow (1997); Sermons of A Devoted Heretic: A Priest Offers Messages of Hope to Faithful Doubters (1999); Seven Sayings of Jesus: How One Man's Words Can Change Your World (2001); Findings: Lectionary Research and Analysis, Commentary on the Sunday Gospel Readings (2003); and A Life Of Courage: Rabbi Sherwin Wine and Humanistic Judaism with Dan Cohn-Sherbok and Marilyn Rowens (2003). I'm the author/artist and I want to review Asking.